The International Hot Rod Association is pleased to announce the fan-favorite, 200 mph-plus Nitro Harleys will return to the IHRA Nitro Jam in 2011 for the first time since 2002. “We are thrilled to be back racing with IHRA this season. We are both all about the same thing – making it exciting for the fans and putting on a great show. And from an entertainment perspective, there is nothing quite as exciting as a Nitro Harley,” said six-time Top Fuel Harley World Champion Jay “The Bulldog” Turner. 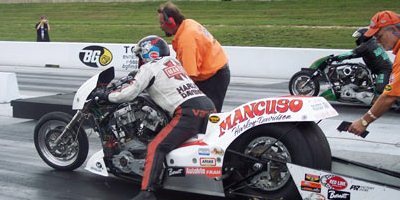 Long time fan of top fuel Harleys.When if at all could any sanctioning body return to los Angeles county,or las Vegas? Any response would be gratefully appreciated . Thank you.